(1964) "It's Too Late" / "I Feel the Earth Move"
(1971) "So Far Away" / "Smackwater Jack"
"It's Too Late" is a rock ballad from Carole King's 1971 album Tapestry. Toni Stern wrote the lyrics and King wrote the music. It was released as a single in April 1971 and reached number 1 on the Billboard Hot 100 and Adult Contemporary charts. Sales were later gold-certified by the RIAA. Billboard ranked "It's Too Late" and its fellow A-side, "I Feel the Earth Move", as the No. 3 record for 1971. The lyrics describe the blameless end of a loving relationship. Music critic Dave Marsh saw implicit feminism because the woman left the man. Marsh also remarked on the maturity of the theme. Music critic Robert Christgau wrote that "if there's a truer song about breaking up than 'It's Too Late,' the world (or at least AM radio) isn't ready for it." Marsh described the melody as Tin Pan Alley and the arrangement as a cross between light jazz and "L.A. studio craftmanship." Rolling Stone remarked that King's "warm, earnest singing" on the song brought out the song's sadness. According to author James Perone, the feel of the song is enhanced by the instrumental work of Danny Kortchmar on guitar, Curtis Amy on saxophone and King on piano. Kortchmar and Amy each have an instrumental solo. The sadness of the song is emphasized by its minor key. Perone pointed out several melodic techniques used by King to help make the song a hit. She builds the melody out of syncopated rhythmic motifs which are modified and combined over the course of the song, in contrast to other songs commonly repeated rhythmic phrases. Perone also thought that she made the melody memorable by repeating the highest note several times before the descending to the tonic. This marks the highest and lowest notes in the listeners ear, aiding recognition. An important emotional element of the melody is that rather than resolving on the tonic at the end, as most songs do, "It's Too Late" ends on the mediant, which is related to the tonic but leaves a sense of inconclusiveness. This contrasts with the lyrics, which imply that the singer has fully accepted the end of the relationship. Toni Stern told author Sheila Weller that she wrote the lyrics in a single day, after her love affair with James Taylor ended. The recording won a Grammy Award for Record of the Year in 1972, and the song is included in Rolling Stone's 500 Greatest Songs of All Time. "It's Too Late" has been featured in Hollywood films, including Fandango (1985), The Lake House (2006), and Invincible (2006). King's version of "It's Too Late" peaked at No. 1 on the Billboard Hot 100 and Adult Contemporary charts. It was on the Hot 100 as a double A-side with "I Feel the Earth Move". King's version of "It's Too Late" was gold-certified by the RIAA. 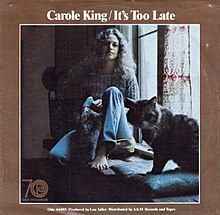 "It's Too Late" won a Grammy Award for Record of the Year in 1972. "It's Too Late" is ranked No. 469 on Rolling Stone's list of the 500 greatest songs of all time. Together with its other A-side, it was named by the RIAA as No. 213 of 365 Songs of the Century. 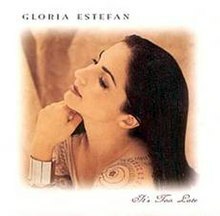 "It's Too Late" was the third promotional (US), and fourth overall single released by Gloria Estefan on her fourth studio album Hold Me, Thrill Me, Kiss Me. ^ "Counterbalance No. 66: Carole King's 'Tapestry'". PopMatters. ^ a b c d e f g h Perone, J.D. (2006). The Words and Music of Carole King. Greenwood Publishing. pp. 34–35. ISBN 9780275990275. ^ a b c Marsh, D. (1999). The Heart of Rock and Soul. Da Capo Press. pp. 312–313. ISBN 9780306809019. ^ Christgau, R. "Carole King". robertchristgau.com. Retrieved 2014-04-15. ^ "500 Greatest Albums of All Time: Tapestry". Rolling Stone. Retrieved 2014-04-13. ^ Dean, M. (2003). Rock 'n' Roll Gold Rush. Algora. p. 256. ISBN 0875862071. ^ Steve Sullivan (2013). Encyclopedia of Great Popular Song Recordings, volume 2. Scarecrow Press. pp. 326–327. ISBN 0810882957. ^ Sheila Weller (2009). Girls Like Us: Carole King, Joni Mitchell, Carly Simon - and the Journey of a Generation. Washington Square Press. pp. 325–328. ISBN 9780743491488. ^ "Brother, Brother, Brother > Charts & Awards > Billboard Singles" at AllMusic. Retrieved 17 October 2011. ^ "Quartz - It's Too Late ft Dina Carroll". ChartStats.com. Archived from the original on 2012-07-24. Retrieved 17 October 2011. ^ "Various- 80's Re:Covered - Your Songs With The 80's Sound". discogs.com. Retrieved 23 December 2015. ^ a b Steffen Hung. "Forum - 1970 (ARIA Charts: Special Occasion Charts)". Australian-charts.com. Archived from the original on 2016-06-02. Retrieved 2016-07-27. ^ "Item: 7739 - Library and Archives Canada". Bac-lac.gc.ca. Retrieved 2016-07-27. ^ "Image : RPM Weekly - Library and Archives Canada". Bac-lac.gc.ca. Retrieved 2016-07-27. ^ a b c d Hawtin, Steve; et al. "Song title 422 - It's Too Late". tsort.info. Retrieved 17 October 2011. ^ "flavour of new zealand - search listener". Flavourofnz.co.nz. Retrieved 2016-07-27. ^ "Cash Box YE Pop Singles - 1971". 50.6.195.142. 1971-12-25. Archived from the original on 2015-06-26. Retrieved 2016-07-27. "That's the Way Love Is"
"What It Comes Down To"
"Fight the Power (Part 1)"
"Take Me to the Next Phase (Part 1)"
"I Wanna Be with You (Part 1)"
"It's a Disco Night (Rock Don't Stop)"
"Don't Say Goodnight (It's Time for Love) (Parts 1 & 2)"
"Words Get in the Way"
"Rhythm Is Gonna Get You"
"Can't Stay Away from You"
"Oye Mi Canto (Hear My Voice)"
"Con Los Años Que Me Quedan"
"Hold Me, Thrill Me, Kiss Me"
"Abriendo Puertas A La Navidad"
"You'll Be Mine (Party Time)"
"I'm Not Giving You Up"
"Show Me the Way Back to Your Heart"
"Heaven's What I Feel/Corazón Prohibido"
"Don't Let This Moment End"
"No Me Dejes de Querer"
"Tres Gotas De Agua Bendita"
"You Can't Walk Away from Love"
This page was last edited on 29 January 2019, at 03:57 (UTC).